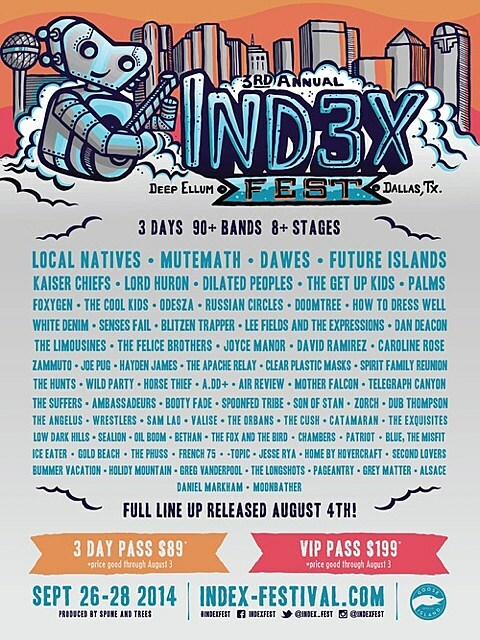 The 3rd annual Index Fest goes down Deep Ellum in Dallas this year from September 26-28. The initial lineup is listed below and includes Local Natives, Future Islands, The Get Up Kids, Foxygen, Russian Circles, How To Dress Well, Joyce Manor, Palms, Dawes, Kaiser Chiefs, Dilated Peoples, Doomtree, The Cool Kids, Lee Fields and the Expressions, Dan Deacon and many more. You can get single-day and 3-day tickets now over at the festival website. Full lineup will be announced on August 4.